Wetsuit vs Drysuit: What are the Differences? Many people (including myself originally) get a bit confused when you talk to them about Wetsuits and Drysuits. Sure they may look a bit similar but the differences are significant, especially in colder water. In this guide we will be talking about the main differences between wetsuits and drysuits. Many people don’t realise that wetsuits and drysuits overlap into different sports and hobbies. The main ones are..
We will be focusing on these main sports/ hobbies when comparing the two styles. What exactly is a drysuit? Well like the name entails a dry suit is a full piece body suit that is meant to keep your body dry from colder water. They are usually required around water that is 55 F and below or in ugly weather conditions. They offer full protection from cold water and air temperatures because they are constructed from multiple layers of fabric. They are meant to insulate your body and create a second waterproof skin. Depending on what you are using the drysuit for there are different ways to layer them depending on your activity, we will go through that for each section below. In general drysuits are usually more expensive due to the quality of materials going into the layering and can be found within the $400- $1000 range depending on the drysuit. The Inner shell is the lining within the drysuit that is made of different materials depending on the manufacturer. It could be made of thermal fabric, neoprene rubber or synthetic material. Materials are often dependant on the activity that you are doing. The Inner shell is usually within close contact of your body. The outer membrane is the part you see and what protects your body from colder water seeping in. It is usually made of a thin layer of nylon or rubber and has a baggy fit. It is baggy because they are designed to not restrict your movements. What would be a drysuit if water seeped in through your wrists, ankles and neck? Drysuits have compressed rubber rings that prevent water from seeping into those areas. Usually when out in colder water temperatures you need to wear more than just a drysuit. Other accessories include toques, gloves, boots, fleeces helmets, hoods and wide variety of other accessories that are activity dependent (more on that below). A wetsuit is a from fitting suit that is made of neoprene. This neoprene is not waterproof but rather keep a thin layer of water trapped between the suit and your skin. This allows your body temperature to warm up the water trapped and create a level of water insulation that is reflected upon your body temperature. Wetsuits are made for water temperatures of between 55 F and 70 F but a lot of this is also dependant on what the weather conditions are doing. Wetsuits come on many more varieties than drysuits in terms of style and thickness.There are Full body wetsuits, long john, short john, tops and bottoms, we will explain these below. A general rule of thumb is that wetsuits that are thicker and have more coverage are better designed for colder waters and vice versa. This is a full body wetsuit that covers you from neck to ankles. You will usually use these wetsuits in cooler water temperatures. These are the more expensive wetsuits that can run you anywhere from $150 to $600 and up! These wetsuits are the sleeveless and can come as a full body wetsuit or be cut off from knees. These wetsuits are better for water temperatures that are a bit warmer or for paddle sports such as Paddle Boarding or Kayaking. Some people prefer to wear one or the other or both so that their movements are not restricted. Tops and Bottoms are usually a preference for water sports that require full body movements like surfing and wake surfing. They are usually worn in warmer conditions. Wetsuits typically do not require as much layering as Drysuits as they are not used in temperatures that are as cold. Still there are some accessories that you can use to protect you from the elements. Some accessories include a hood, gloves, swimsuit or rashguard is conditions are a bit more chilly. Wetsuits and drysuits are essential items to have when you are figuring out what to wear when kayaking in any water temperatures that dip below 65 degrees Fahrenheit. According to Cold Water Boot Camp of the 410 people that have drowned in Canada 130 of them were by boating and 60% of them drowned in water under 10 C (50 Fahrenheit). I can almost guarantee you that these people drowned because they were not wearing the proper equipment to go boating in. It also went on to say that only 12% were actually wearing a lifejacket (or PFD) and 2% were wearing one improperly. I would consider a drysuit in colder climates where both the air temperatures and water temperatures are below 55 F. I live in Canada, so while in the summer in most conditions a drysuit is overkill but in the winter it is essential. When doing any sort of kayaking in colder conditions you are dressing for IF you flip over. Chances are you will flip your kayak at some point so you definitely don’t want to chance it when you are winter kayaking. If wearing a drysuit it is recommended that you wear a PFD, long underwear, a drysuit liner and a thick fleece. While drysuits do protect you from cold water they do not protect you from cold air temperatures so layer accordingly. Additional accessories you may want to wear includes paddling gloves, a toque, waterproof shoes and socks. Wetsuits are good for kayaking in water that is between 70 to 55 degrees Fahrenheit. The ideal setup when kayaking is to wear a drysuit that is sleeveless. This is because often times you will be doing a continuous paddling motion. With a full body suit there may be chafing that happens in areas that are constantly moving so it is best to get a Short John, or Long John suit depending on the water temperatures. When looking at wetsuit thickness think of the type of climate you will be using this wetsuit in. The thicker the wetsuit the more insulation it gives you in cooler water and air temperatures. Layering is more varied with wetsuits because there is a bigger variety of conditions you can layer for. Often times you just need a bathing suit underneath hats and sunscreen in warmer conditions. In cooler conditions and climates you could be wearing a thicker wetsuit neoprene socks, water shoes and gloves. Don’t forget to wear a proper PFD in all conditions! When choosing a wetsuit vs a drysuit for board sports like surfing, paddle boarding and wakeboarding you are looking at what the weather conditions are. Unlike kayaking using a drysuit is a bit more rare because typically these water sports are done in warmer temperatures but there are exceptions to every rule. Even though a drysuit is a bit more restrictive in movement it is still a good idea to wear them in temperatures that are below 55 F.
By far wearing a wetsuit when doing any of these board sports is the most common because they tend to happen in temperate and warm climates and are generally not restrictive in nature. To be honest drysuits are not specifically designed for board sports and fit paddle boarding better than wakeboarding or surfing because you are not moving your body as much. 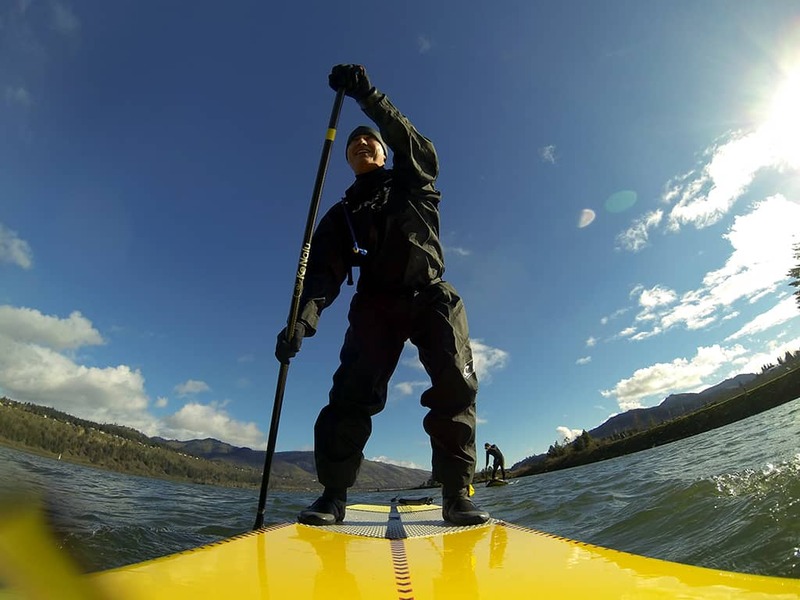 Drysuits are more designed for cold water diving and paddle boarding. Specifically for surfing they really hamper your ability to surf because they are more baggy in nature and they tend to slow you down in the water. It is only reasonable to be wearing a drysuit when paddle boarding really. When paddle boarding I would use the same set up as kayaking where you dress for the weather. Include a Fleece, drysuit liner, toque (non cotton), waterproof shoes and socks. The latter two are important as your feet will constantly be getting wet from moving around and waves slapping against your board. Paddle Boarding can be a bit more difficult to prepare for but if you use the kayaking rule of thumb: “Dress like you’re going to go into the water” it makes it a bit easier. I will say you do not have to go as extreme into wetsuit attire as surfing because you are not going to be constantly in the water. You just need something that will keep you warm if you do happen to fall in a time or two, but this is also dependant on your experience. In warm summer like conditions of 65 Degrees and over you can just wear board shorts, swimsuit and maybe a shirt if it is warm enough. When the Water temperature starts dropping below 65 degrees then it’s time to consider a wetsuit or the very least a rashguard if you are going to be close to shore. There are a variety of different kinds of wetsuits you can wear. Paddle Boarders typically like the sleeveless kind because it does not constrict their paddling motion. This is especially crucial if you are into touring SUP’s or paddling long distances. In colder temperatures you can layer your Rashguard with your wetsuit for more insulation. This method will also save your from any skin irritations or chaffing that may occur. need to first ask yourself a few questions. How often you surf ultimately depends of you but if the water temperature is cold year round and you love to surf chances are you will be getting more use out of it and should be getting a good quality wetsuit. Another important factor when it comes to wetsuits is how well it fits your body. A good fitting wetsuit should be snug and fit like a second pairing of skin. A good way of testing this out is by raising your hands up in the air and only feel the slightest bit restricted. If you are unable to do this than it is too small. Some good quality wetsuit brands include Billabong, Quicksilver, Rip Curl, O’Neill and Body Glove. Although Wakeboarding is primarily done during warmer weather and water temperatures, you can extend your season by a few months if you decide to wear a wetsuit. Because you are doing similar movements to surfing you can look at the wetsuit guide for surfing above and most of it will apply to Wakeboarding. Compared to Kayaking and Board Sports you are in the water for far longer so knowing what to wear in what temperature is crucial. Leisurepro provides a quick table to refer to. The main differences between wetsuits and drysuits is that drysuits are used in very cold water conditions and are loose fitting while wetsuits are used for temperate to colder conditions when diving. Drysuits for diving purposes are made differently than drysuits for kayaking. There are two types of drysuits for diving purposes, membrane and neoprene. Membrane drysuits are made up of a number of different layers of material that are meant to keep you dry. These suits are best for conditions of that are temperate to ice cold temperatures. When using these drysuits layering is still very important so you may need to pack some sort of undergarment to keep you insulated. Neoprene drysuits are warmer then their membrane cousins and are better if you like a tighter feel or are used to wearing wetsuits. These wetsuits are a bit more durable but can stretch out over time so proper care is warranted. When choosing a correct drysuit it is important to think long term and to get something that will fit you well. Choosing a well known brand is often a wise decision. More on drysuits here. 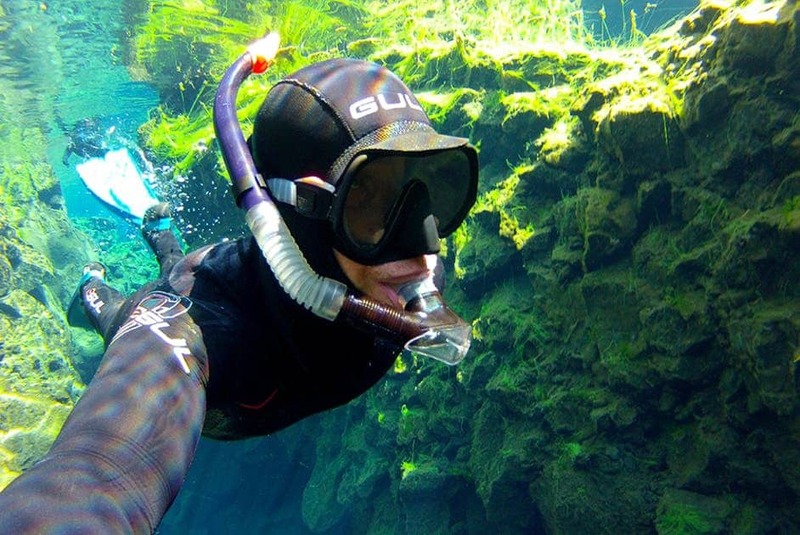 Wetsuits are ideal for divers that dive in warmer to temperate waters. The sweet spot temperatures typically range from 50F to 90F but are also dependant on weather, climate etc. Most of these wetsuits are made of neoprene that isolates you. You choose the style of wetsuit you want based on the water temperature you are diving in. Thicker wetsuits will provide more insulation and will allow less water in while thinner wetsuits allow more water in and provide less insulation. The thickness of these wetsuits ranges typically from 3mm to 7mm, 3mm is for warmer waters and 7mm is for colder water temperatures. Just to further complicate things wetsuits come in a wide variety of different styles.. Pretty much a full wetsuit that comes in a variety of different sizes and thicknesses. The most common being 3mm, 5mm and 7mm. This wetsuit does not have any sleeves (hense farmer John name) that comes in different thicknesses. More ideal for temperate to warmer temperatures. I recommend trying some styles and seeing which best suits you are your movements. Choosing between a wetsuit and a drysuit is not as hard as many think. Simply decide.. Simply put in most cases in water temperatures that are under 55F it is best to slip on that drysuit. Anything above 55 F and 70 F is Wetsuit weather.